Whether you’re a fishing novice and looking to hook a fish for the first time or you’re a practiced fisher, you likely know the importance of using bait to attract a fish to your line. What works for freshwater doesn’t always work for saltwater, just as what may work for catching a particular species in a river or brook may be different from trying to catch them in an open lake or ocean. Both chum – or cut bait – and live bait are common options for fishing in the Gulf, as are artificial bait lures. Let’s take a look at a few of the advantages of each. Depending on the specific type of fish you’re trying to hook, live bait may be the best option for your fishing trip. Live bait encompasses a wide range of options, including cigar minnows, pin fish, blue runners, sardines and mullet. These are often held in a tank aboard the ship to keep them fresh and lively, and when baited on your line offer natural movement and appeal to your prospective prey. Many fish prefer live bait, and it is often the best option for many of the most attractive catches, like king mackerel, several species of flounder and cobia. Cut bait is another frequent option for fishing in the Gulf. Many of the same bait fish species that are used for live bait can be turned into chum, providing a convenient way to reuse the same bait for multiple target fish species on the same trip. Cut bait tends to be more aromatic and release more tastes and smells that can appeal to fish – just look how crazy sharks go for chum during “Shark Week” episodes each year! Chum is great for catching redfish, snapper, and different varieties of tuna, with the latter also often lured in by whole, uncut dead fish as well. Another popular choice is artificial lures, which come in a wide variety of designs, shapes and styles. Just as with chum and live baits, every variety of fish has a different specific general preference that may work better or worse, depending on what you’re trying to catch. 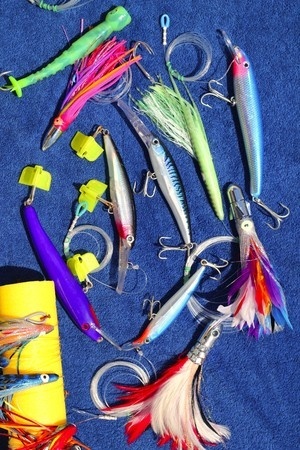 Most lures are made of rubber or latex and can emulate a lot of natural movements while adrift in the water. Adding metallic allures can also help improve the artificial bait’s effectiveness by creating a distracting and interesting sight for fish. Artificial lures are a great choice for catching wahoo, dorado and king mackerel, for example. For even more great information on bait, fishing methods and peak fishing seasons, check out the extensive guide on Outdoor Alabama, the state Department of Conservation and Natural Resource’s official website. No matter what you put on the end of your line, the start of your trip is getting on the water. Let The Triple Trouble and Capt. Chad be your guides to great fishing. Call us at 256-431-5767 or email Chad today to book your trip!